What Is Cereal at Midnight? Burt Reynolds spent a lot of the 1970s making movies that were set in the rural south and are sometimes called "hick flicks." With the two Gator McKlusky movies, we have one of his best and...another one. When I mention Burt Reynolds, chances are you have a particular movie in mind. If not a movie, you have an image of The Burt, and he's probably wearing a cowboy hat and has a mustache. After the success of 1977's Smokey and the Bandit, The Burt rode the trend of rednecks in fast cars all the way to the bank, starring in multiple sequels and similar films that invariably put him behind the wheel of a race car or a souped-up sports car. This isn't a knock! Hey, it's why we love The Burt. And if you don't love The Burt, then you just haven't watched enough Burt movies. But during the handful of years between Burt's first critical success in 1972's Deliverance (a movie that both captures and vilifies the rural south) and his super-stardom, thanks to Smokey and the Bandit in '77, Burt Reynolds starred in a handful of middle-grade pictures that are among some of the most interesting of his entire career. A couple of these films center around the awesome character of Gator McKlusky. 1973's White Lightning is a really difficult film to categorize. Burt Reynolds is Gator McKlusky, a good ol' boy who is doing time in prison for illegally selling and running moonshine. When he discovers that his brother has been suspiciously murdered, he makes a deal with the feds: they'll release him from prison so he can help them bust an illegal moonshine ring, and if he decides to pursue vengeance for his dead brother on the side, the feds will look the other way. White Lightning, which takes its name from the slang term for moonshine, is a really unique movie that goes all over the place. Sometimes it's funny, sometimes it's exciting, and sometimes its unnerving. The Burt is incredibly intimidating as Gator. There's something dangerous about clean-shaven Burt that doesn't translate to mustached Burt. It's a well-known fact that he was a stunt man earlier in his career, and he's built like a brick house in this movie. He just looks tough and ready to deal pain, which is one of the reasons to watch a revenge movie. Ned Beatty, Burt's co-star from Deliverance, is the crooked sheriff that Burt has to take down. 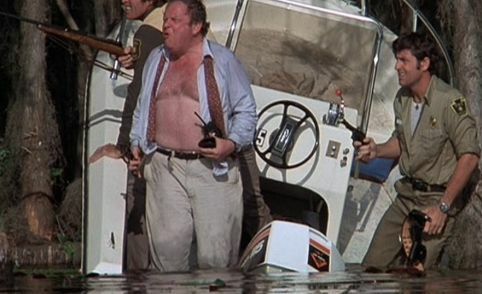 If anyone was ever born to play a crooked official, it's Ned Beatty. He conveys that sense of entitled sliminess that makes you really want to see him knocked down a peg or two. Jennifer Billingsley is his leading lady; she didn't do many films, but she's fantastic as a southern girl who knows what she wants (what she wants is Burt). She has a casual confidence and likability that really benefits this movie. You don't necessarily think much about how great she is while you're watching the movie, but afterward you realize how much she added to it. One of the things that makes White Lightning so interesting is the tone. There isn't a lot of artifice in the movie. What I mean is that White Lightning filmed in the rural south (in Arkansas) and frequently uses real locals as extras and in small parts. It feels really authentic, and this movie was made at a time when the south was in a state of transition; the larger world was coming into its borders, but it was still a very closed-off place, and could have been very scary and dangerous to someone who wasn't welcome there. Later hick flicks like Smokey and the Bandit show a funny, occasionally charming version of the south that make it easy to root for Burt and boo the cops; White Lightning feels a whole lot more dangerous and less cute. Remember the beginning of First Blood with Stallone as Rambo? Rambo wanders into a town looking for an old war buddy and discovers that he isn't welcome by the authorities, who then proceed to abuse their authority and do lots of things cops aren't supposed to do. This is that times ten. Just substitute shotguns for fire hoses and take out all the man-tears. Of course, another major factor in the appeal of this movie is the car stunts. While we now live in a world where you can see cars jump out of airplanes or race on a frozen lake in the Fast and Furious franchise, there is a disconnect in our brains because we know none of it is real. Well, the stunts in White Lightning are real, and you can tell. When a car gets t-boned and you see the panels crush in, you feel the realism. When cars launch into the air and bust their struts when they hit the ground, you know it's real. 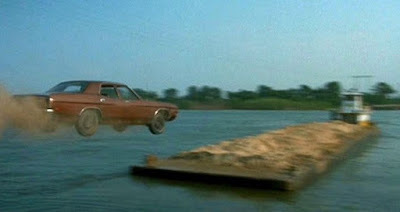 When a vehicle attempts to jump a ramp from the bank of a river to a barge that is many yards away in the water, it becomes an amazing spectacle, and part of the charm of this movie is seeing what's going to happen next. White Lightning is a fantastic little movie that needs to be seen and appreciated by movie fans. According to Burt himself, they knew the movie would do well in the south, but were stunned when it made even more money when it opened in the north. See? Everybody likes it. Maybe that's why the sequel Gator leaves a lot to be desired. filmed three years later in 1976, Burt was on the cusp of being a mega-star and had spent the last few years building his brand. Therefore, the Burt that we get in Gator is a very different guy than the one who showed up in White Lightning. The Hollywood polish and slickness that was thankfully missing from White Lightning is present in spades in Gator, but that also means that the sense of threatening realism is gone. Burt doesn't even look the same: he's got the 'stache and he appears to have lost a considerable amount of weight, making him look a lot less dangerous and a lot more like any other '70s actor. Hal Needham was Burt's stunt double in these and many other movies, and he has admitted in his book that Burt had a pretty fierce coke problem. I don't think it's my imagination that you can see it here. Check out the posters that grace the box art at the top of this post and compare Burt in those two depictions: they're very different. This time around, Gator McKlusky is tasked with taking down a crooked politician named Bama McCall (such a great name), played by Jerry Reed. You cannot go wrong with casting Jerry Reed in a movie, and you'd be wise to let him write and play the theme song for your film while you're at it. Jerry Reed was one of country music's most talented and in-demand session guitar players during the 1960s and 1970s, and he had a personality the size of Texas. Apparently things went well between Burt and Jerry on this movie because a year later they both ended up working on Smokey and the Bandit, which I'm sure Burt had a lot of control over. We also get to see Jack Weston (Dirty Dancing) as a federal agent. He's likable in the role, and fun to watch. He's probably the only one who is playing something akin to a normal human being. You can't help but feel that this role would have gone to Dom DeLuise if the movie had been made just a few years later. Gator takes Burt's character and moves him from the rural dirt roads of Arkansas to the beautiful majesty of Antebellum Savannah, Georgia. I absolutely love Savannah, but it's an odd choice for this movie, especially considering how different it is from the environment we know from the first movie. Beaches and bayous and plantations are quite a departure from the backwoods vibe of the one-traffic- light town seen in White Lightning. The tonal shift seems to be completely deliberate, because not only is Burt a whole lot more city-savvy (he stays at the swankiest, most exclusive hotel in Savannah) than we've previously seen, but even his leading lady is a successful career woman. Lauren Hutton is pretty good as a news woman who is on the cusp of a big breakout. She and Burt don't have a ton of chemistry on screen (Burt says she was hard to work with and kept flashing the crew), but it doesn't really matter because this is clearly the Burt Reynolds show. Ego seems to be a real issue plaguing Gator. Gator McKlusky is a whole lot less of an anti-hero in this movie and a whole lot more of a southern charmer (cue Burt's signature bird call laugh) and he really seems to be trying to make the character a southern James Bond. Burt not only stars as Gator for the second and last time, but makes his motion picture directorial debut here as well. It's mostly fine; there are a few things I can point to and say "this doesn't work" (like a scene where Gator and company break into a building while toting a couple of cats, because why not), but there's nothing remarkably offensive. The Burt says he took over the project because he didn't want a bunch of northerners making a movie about the deep south, but then he chose to make a movie that feels as far away from White Lightning as it could get. I'm not really even complaining, because the movie is totally watchable. In a world where White Lightning doesn't exist, Gator is a satisfying mid-'70s action movie. But the character feels completely disconnected from the one we came to know in the first movie. If he wasn't named "Gator," this could be a whole different character. Ultimately, it's nice to have Gator so we can see a progression of the character from the dirt roads of Arkansas to the big city lights of Savannah, but I'd be lying if I said I didn't wish that the sequel had stayed more grounded. Imagine if The Dukes of Hazzard suddenly switched settings between seasons and ended up in New Jersey. Okay, it's not quite that jarring, but it's not too far from that. 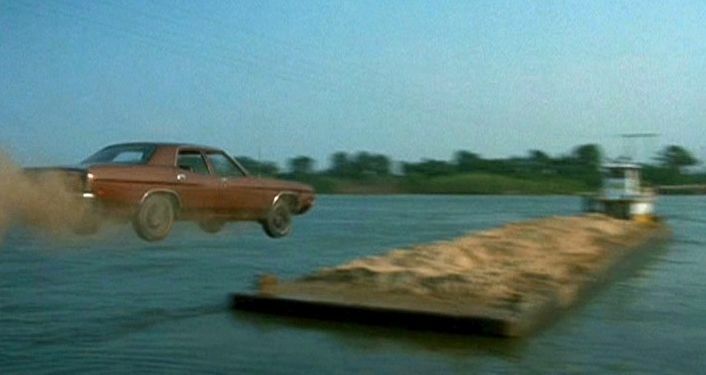 Luckily, there are more great stunts to be seen in this movie too, such as the bayou boat chase that kicks off the film and some fun car stuff. In the end, I love White Lightning, and I guess I kind of love Gator because it's connected to White Lightning, though its flaws are a lot more obvious. I think the character of Gator McKlusky is a really interesting anti-hero that you don't quite feel comfortable rooting for because he does some terrible things, but that you secretly want to see win. The early-to-mid 1970s were such interesting years for movies because America was so unhappy and angry, and that manifested itself on screen in different ways. Watch White Lightning for the gritty, realistic story about moonshine and revenge in the deep south, and watch Gator for the slick production and glimpses of the Hollywood star Burt Reynolds was slowly becoming. 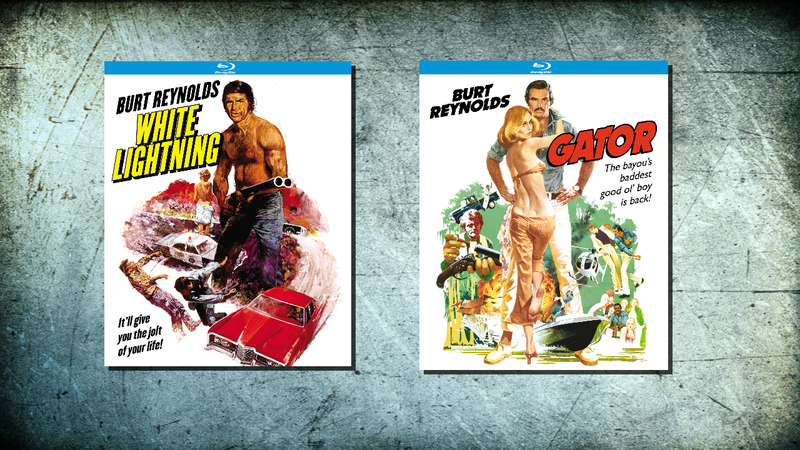 You can buy White Lightning and Gator on spiffy Blu-rays from Kino Lorber. Tell 'em Bama sent you. Classic Europop with an American accent. If adventure has a cousin, it must be Allan Quatermain. Has Batman Become Too Dark? The final issue of Bubba Ho-Tep and the Cosmic Blood-Suckers leaves us wanting more.